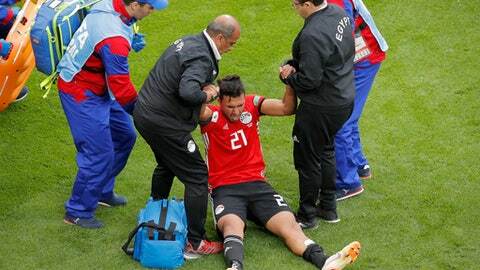 ST. PETERSBURG, Russia (AP) For the millions of Egyptians who watched on TV, Friday’s loss to Uruguay in the country’s first World Cup match since 1990 could not have come at a worse time. And not just because it came in the 89th minute. Fans of the Pharaohs, as the squad is known, were desperate for some reprieve from the hard times they’ve endured over the past two years amid an economic reform program. In the last few weeks alone, authorities raised fares of the Cairo metro by up to 250 percent, drinking water by up to 45 percent and electricity by 26 percent. A third round of fuel price hikes since late 2015 is widely expected this summer, a move likely to send prices soaring further. ”If we want to become a real nation, we must suffer pain and endure hardships,” Egypt’s general-turned-president Abdel-Fattah el-Sissi, the architect of the economic reforms, has said – a signal perhaps for more price hikes. It’s in this context that returning to the World Cup after 28 years and the rise to global stardom of native son Mohamed Salah with Liverpool have lifted the spirits of a battered nation longing to party. In recent months, Egypt has been gripped by a World Cup and national team mania that, in some ways, appeared to serve for many as a pleasant distraction from the daily struggle to make ends meet. Television commercials for mobile phone providers and starring members of the squad were endlessly discussed. Songs were composed in their honor and constantly played on radio and television. Some fans replaced their profile photos on social media with images of the team. Thousands of fans have spent a small fortune traveling to Russia to support the team. Monitoring Salah’s recovery from injury, sustained in Liverpool’s Champions League final against Real Madrid last month, became something of a national obsession as fans debated whether or not he’d be fit enough to play in the World Cup. Together, patrons in Cairo’s cafes prayed that Salah would play. Children seemed the more anxious, hoping the striker who inspired so many of them to take up soccer would recover and play. ”OK, let’s pray for the rest of them,” 68-year-old Ahmed el-Fayoumi, realizing that Salah would start on the bench at Yekaterinburg, told the two grandchildren he brought along to watch the match at a Cairo cafe. ”God, lend us support,” yelled 47-year-old Adel el-Fiki when the screen showed Uruguay and Barcelona marksman Luis Suarez walking to the pitch. El-Fiki then sought divine intervention against Uruguay, reciting a Quranic verse that speaks of how God blinds his enemies. At the end, a late Uruguay goal left most Egyptians dumbfounded, although many had expected a heavier scoreline from the better-organized Uruguay than the 1-0 defeat. ”That goal is painful. In the last minute? That’s haram (forbidden by God),” el-Sharkawi said of Uruguay’s late goal, a header by defender Jose Gimenez that highlighted Egypt’s aerial weakness. The result left the Pharaohs with a formidable task if they are to advance beyond the group stage. They need to avoid losing to host Russia and then beat Saudi Arabia on June 25. Russia beat Saudi Arabia 5-0 in the tournament’s opening game in Moscow.